I’m super excited to be traveling to OnStage Live for the Stampin’ Up 30th Anniversary party! Almost 10,000 demonstrators from around the world are going to be descending on Orlando, Fl in November for 3 days of celebration and excitement as we see the newest upcoming spring releases. This year, they are inviting some number of demonstrators to be display board stampers and design ideas and inspiration for all those demos coming to OnStage. I would love to have the chance to create and share for OnStage, so I wanted to pull together some of my favorite cards & projects from recent classes and my own craft room playing. 🙂 Those of you stopping by from Stampin’ Up’s home office, thank you for your consideration! A lot of my cards lately have been about mixing and matching different project supplies from my craft room so you can see how they go together. The cards are a bit more clean and simple (I tend to either go lots of layers or clean and simple). Ombre Sponging with the Sponge Brayer, mixed with coloring rhinestones using a sharpie and the amazing Wood Textures designer paper! It makes the perfect background for the Rooted in Nature stamp set. Simple layers to highlight the amazing new colors – Soft Seafoam & Grey Granite with Pool Party. Plus using the Stamparatus to get perfect background stamps using the Handwritten background stamp. The leaf and sentiment are from the Tropical Chic stamp set. Finally, I used my favorite Grey Granite texture weave ribbon for a bit of texture. Because everything is cuter with ribbon and/or embellishments! This last card was showing how mixing and matching embossing makes for awesome effects! 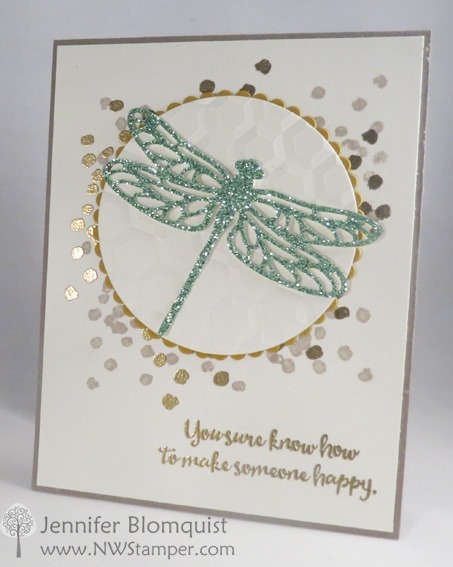 I stamped some and heat embossed extra of the background dots from the Dragonfly Dreams stamp set. Then we layered over it some circles that had been embossed with the Hexagon Dynamic Embossing Folder. Add on a glittery die cut and simple sentiment and you have a card that wows in person! I love using patterned paper to create scrapbook layouts and layering them to make my photos really stand out! I wasn’t too sure at first about the Tranquil Textures designer paper but it was just the right look and colors to go with this photo of Caitlin at the beach. The extra embossing with the sneak peek Corrugated Dynamic Embossing folder was a fun touch. Plus it is soooo easy to make longer than 6″ pieces look continuous with this embossing folder. It is going to be a must-have from the upcoming Holiday Catalog. Though I just have to show you a close up of the page title! I did gold foil backed die cut words from the Sunshine Wishes thinlits. And even created my own “my” by cutting up another “sunshine” and gluing them together! Inside the gift card holder box! And a gussied up Silver Mini Gable Box. I did this at an event to show people how the Support Ribbon dies and matching Ribbon of Courage stamp set are for more than just support cards. Most people didn’t even realize these flower and leaf dies were in the set! An easy way to make a perfect favor box. I hope you enjoyed my projects I shared today. I’d love to hear what you think by having you leave me a comment and sharing which is your favorite! Some of these projects are new and I’ll be sharing full details soon on the blog, so please stop back by or leave me a comment and I can share more! I hope to see some of you at OnStage in November as well!